If you have been following my blog for a while you will know that spiral strings are my favourite. With a request from Karen Lynn I have put together a guide of tips and ideas. I have found that by dividing the spiral into sections any tangle will fit. 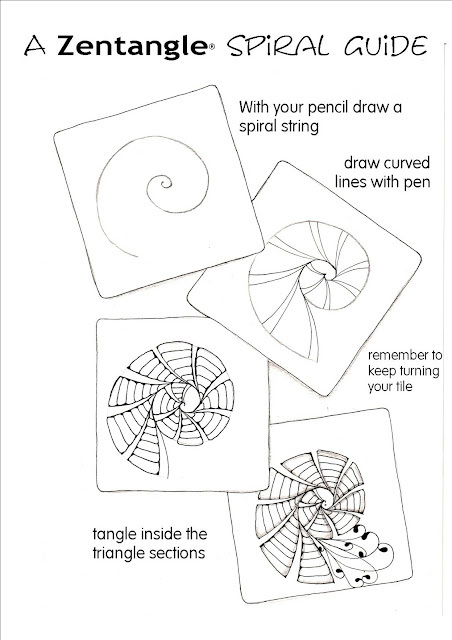 Remember to always draw your string with a pencil and keep turning your tile. I hope you have fun with my spiralations. Wow! These are very cool! Thanks for sharing your creativity! Thanks Shelly for this great lesson on spirals. You are definitely the spiral queen! Think I'll give them a try! Great demo of your spiral strings and design process! It's like a blast of sunshine to peek into the right-brain of a creative talent!! Thank you so much for sharing. Well done. Ooo ooo ooo! Printing this for reference! I'm hoping to do another piece with a nautilus spiral but my want-to-do list is a little backed up. Muchas gracias! Fantastic - I'm gonna save this! thank you - my spirals never look quite right! This is fantastic, Shelly! Thank you for sharing. I'm linking to this post in this week's roundup. Definitely a keeper - what a great and generous gift to the tangle community. Thanks Shelly. exquisite for this lover of the balance and sacred geometry the spiral represents for me. So many possibilities, will just have to make the time, mmmm who needs sleep LOL. I just love it love it! Thanks so much. This is really wonderful and so inspiring! Thanks so much for sharing this, Shelly! Printed and saved for reference. Thank you so much for sharing your spirals with us. They are all beautiful! Thanks Shelly! you've inspired a big bunch of people posting this!! You have a joyful way with spirals and now you have shared that in a big and beautiful way so that others can find their own joy! Oh my gosh! I just came up for air after throwing a big party for my husband's 60th, and I saw this fabulous post, with a shout-out no less. It was like it was MY birthday! Thanks so much, Shellie. Such great ideas and beautiful examples. I'll no longer suffer from fear of the spiral. I'm so excited to try them all!!! Best post I've seen in ages! Love the examples. Oh my! I always said you have a special touch for spirals and this proves it. Thanks for the lovely tutorials. Thanks for sharing... these are great. Was trying to figure out something to do with a spiral today! Just in time! What a beautiful way to tangle! Have not yet considered it, but now my head is swirling (no pun intended) with ideas. Thank you for your inspirational guide. Oh my! Such a great resource for inspiration and things to try! Thanks so much for sharing! another spiral lover here, guess that's why I like zendala's so much too. Great tutorial, thanks for sharing your gift with the world. I love the spirals! I think I can do that! You are very talented. 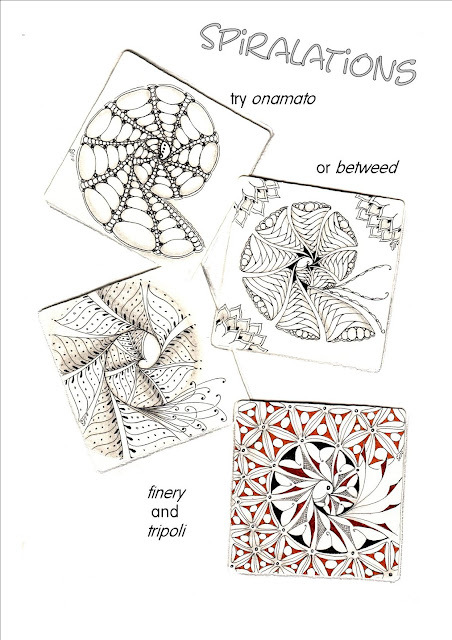 My favorite is 'floo' and I love the very last square of tangles with the negative space and the ribbon holes. Totally Awsome Shelley. I hope you don't mind that I printed off for my Inspiration File. Thank you so much for sharing with all us Wannabees!! Love love love...This is so very inspiring! Thanks for this Amazing tutorial! That is pretty cool Mum, what lovely comments, great tutorial! P.S. Ive missed you and the gang !! gorgeous. Now I am off to work on my spirals. Thanks for the helpful hints. Love it! Thank you,Michele! 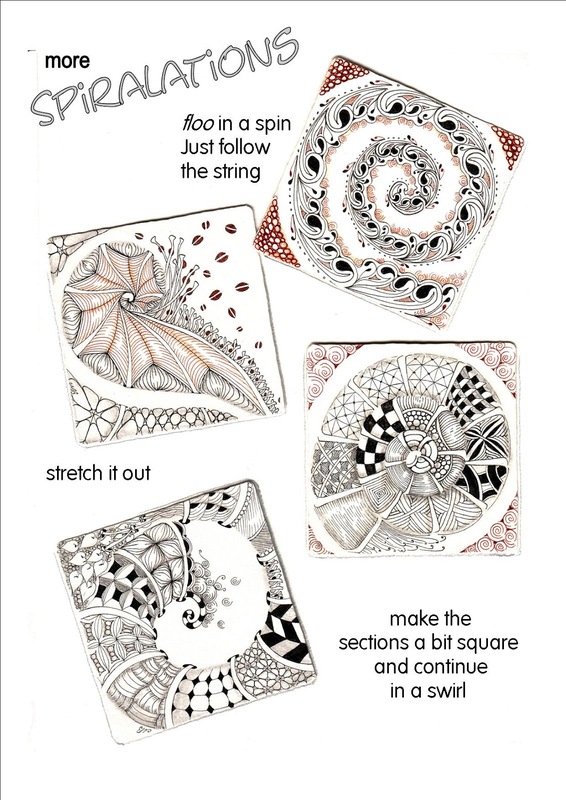 I've used spirals in my polymer work for many years... Zentangles are newer additions. Great post Shelly. Thanks so much for the inspiration and sharing your spiralations! They're gorgeous - as always. Just wow! Thanks so much for the inspiring art. These are cool, love them and thanks for sharing. I thought I was the only one who saw everything in spirals .............. Love, love, love your work. I just found this on TanglePatterns.com when I went to the tutorials for some inspiration. I love what you have done with the spirals. I'm doing a ZIA for a Christmas gift and these will fit in wonderfully. Thank you very much. Hi! I just found this at tanglepatterns.com. Thank you so much for keeping it available. I particularly like the stretched out version, so delicate. There seems to be two "Tracy Marie's". hi there. I been Colouring For awhile and Dediced to Try at Zen Tangles. This is so Cool. Spirals revisited. Yes, indeed, I have been here before, but didn't leave a comment. But now I say what I should have said during my first visit: I loooooove your spirals and all variations thereof. So inspiring! Thanks YOU! Wow.. this Spirals are beautiful, I love the squares one! Thanks for share, I will save it!